Texas Congresswoman Sheila Jackson Lee said Tuesday she felt she was targeted by a passenger accusing her of taking her first-class seat on a United Airlines flight “because I was an African American woman” as the airline said she was not given the seat because she is a congresswoman. 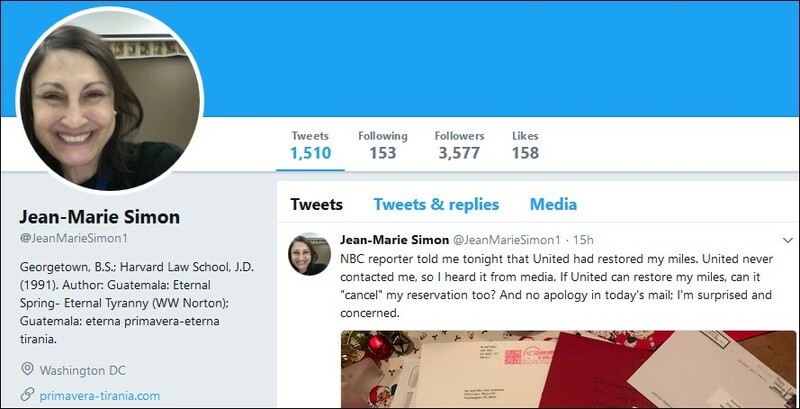 Passenger Jean-Marie Simon accused the airline of giving up her first-class seat on a flight earlier this month from Houston to Washington, D.C., to Jackson Lee, a Democrat, in a report in the Houston Chronicle. "It was just so completely humiliating," said Jean-Marie Simon, a 63-year-old attorney and private school teacher who used 140,000 miles on Dec. 3 to purchase the first-class tickets to take her from Washington D.C. to Guatemala and back home. Jean-Marie Simon lived and worked in Guatemala as a photojournalist between 1980 and 1988, a period of extreme violence and brutality in the country. 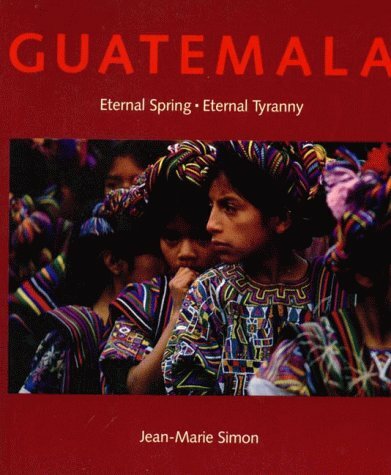 Recently, Jean-Marie donated 1,000 copies of her book Guatemala: Eternal Spring Eternal Tyranny to schools and universities in Guatemala, to keep the truth of what happened alive. Guatemala endured a 36-year civil war that ended in 1996, but it still suffers from organized criminal violence and impunity. At a time when the country is confronting its past, Ms. Simon wants to make sure that young people there will be able to learn what their nation endured under military regimes. ...Few were telling Guatemala’s story when Ms. Simon first traveled to the country. ...Some of her contacts introduced her to others who helped her gain access to people caught up in the conflict. During this time, for example, workers at the Coca-Cola plant had been singled out for assassination. An official with their union gave her a written introduction to one of the guerrilla groups, the Guatemalan Workers Party, whose members took her out with them for a day. ...On one trip, she joined with Allan Nairn and a documentary crew as they traveled to Nebaj and interviewed commanders and troops. In a nearby town, soldiers – who thought they had the blessing of their commander – described how they tortured prisoners. In other places, she and the film crew saw how the military was forcibly moving indigenous people into “model villages” while pressing the men into civil patrols. ...In later years, she prepared reports for international human rights groups and connected visitors with local advocates who were demanding answers from the military regime. It was a sinister time, when activists would be murdered alongside their infant children. She recalls meeting one woman who told her that she had been raped by soldiers every night for a month – sometimes in front of her father. When the commander decided that she was not a guerrilla, he gave her a bar of soap, five pounds of beans and advice to start a new life. By the time her book was first published, she had decided to go to law school. She practiced for 10 years, then switched to teaching high school Spanish. Now living in Washington, she has returned often to Guatemala in recent years. I've reached out to Rep. Lee's office for comment. I just had a good phone call with Mr. Richardson who informed me that he hadn't seen my item and got on the story after seeing this comment posted on LegalInsurrection.com. I took the opportunity to inform him that this morning I sent these questions to Rep. Lee's office, but that I don't anticipate receiving answers, so would he be willing to follow up? I noted that this individual [Ms. Simon] came toward me and took a picture. I heard later that she might have said “I know who she is.” Since this was not any fault of mine, the way the individual continued to act appeared to be, upon reflection, because I was an African American woman, seemingly an easy target along with the African American flight attendant who was very, very nice. 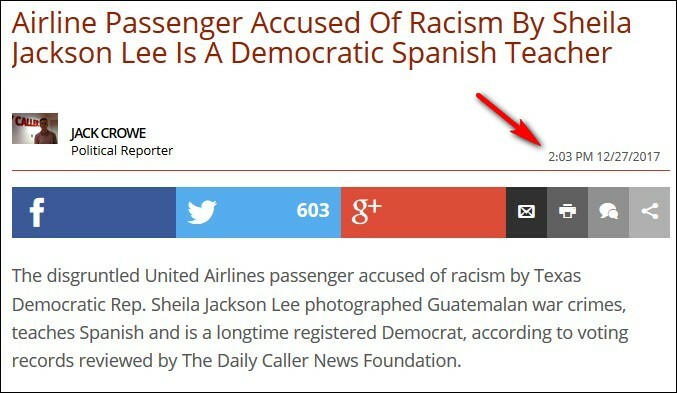 1) On what basis did Rep. Lee conclude that Ms. Simon's actions had anything to do with Rep. Lee being "an African American woman" or the flight attendant being African American? 2) If Rep. Lee can't provide a reason, it's an unfounded allegation that may be harmful to Ms. Simon's reputation. If that's the case, doesn't Rep. Lee owe Ms. Simon an apology? Mr. Richardson agreed to take a look. Just spotted this via The Daily Caller -- based on the time stamp, I still own the scoop. 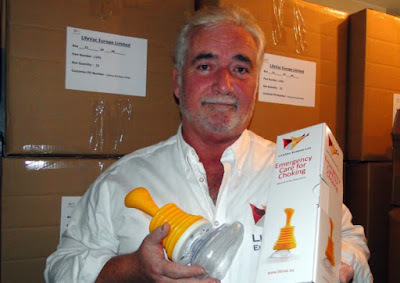 After hearing about a 7-year-old who choked on a grape, (LifeVac inventor Arthur) Lih searched for something as good as or better than the Heimlich maneuver...“I went to the hardware store and I saw a plunger, put it on my face, gave it a pull,” Lih said. “I could feel it was going to be good. I refined it to what it is today. The heartbroken dad of a girl who choked to death on a grape on holiday said one simple device may have saved her life. Jasmine Lapsley was just six years old when one of every parents’ worst nightmares began to unfold on a family holiday in North Wales in August 2014. Parents Rob and Kathy Lapsley, from Anfield, did abdominal thrusts and hit her back after she started choking, but to no avail and paramedics could not save her. Now her dad, 43, is urging a government watchdog to allow a new anti-choking device to go on general sale in the UK. He said he was convinced the hand-held LifeVac suction tool was “easy to use, effective and cheap” and should be in every home, school, hospital and restaurant. ...Eric Banagan, a (Devon-based) spokesman for LifeVac, claimed his product had already saved lives, and that the community in the area where Jasmine died were also unhappy at being denied the devices. (Kathy Lapsley said), "If there is something that can be used that has already saved lives when someone is choking, are you not going to use that and try to save someone’s life or are you going to watch them die too? Her husband Rob Lapsley accused the (Medicines and Healthcare products Regulatory Agency) of “needlessly putting people at risk”. “LifeVac is a portable suction device that can be used when a person is choking and when other forms of first aid have failed to remove the blockage,” he said. “Currently its use and sale is restricted by the MHRA, meaning it can only be sold to health professionals. “This means that the device can’t be sold to schools and other places such as restaurants where choking can pose a severe risk. LifeVac has already saved eight lives and, by restricting its use, the MHRA is needlessly putting people at risk.